How many children have been destroyed by poverty? How many martyrs have offered their lives? For as long as the times are not a-changing, there will always be songs......of our times. Excerpt from the article by Ricardo Caluen for Philippine Reporter for PATAC’s event: Songs of our Times. Apart from sending the occasional balikbayan box to relatives back here in the Philippines, some Filipinos in Canada have found a new way to show that they have not forgotten us. Showing that they still care for people back home, a group of Filipino artists and concerned citizens in Toronto formed an organization that aims to cure the ills that beset Philippine society through the arts. The members of the group feel that art can help Filipinos—wherever they might be—understand the current issues and problems in our society. They also believe that art can help Filipinos realize that they can do something to improve the existing state of affairs, however dire the situation may seem. And so in May 2007, amid news of widespread social injustices and human rights violations in the Philippines, Philippine Advocacy Through Arts and Culture (PATAC) was born. When PATAC was formed, the Philippines was in a state of turmoil. Then Philippine President Gloria Macapagal-Arroyo was being accused of corruption, causing her ratings to plummet. Violence and fraud marred the mid-term elections in May. Everyday, there were reports of extrajudicial killings on television, radio, newspapers, and the Internet, filling Filipinos all over the world with fear and dismay. In Toronto, Canada, a number of Filipinos were particularly alarmed by news of the increasing number of children being subjected to violence, abuse, and other forms of cruelty. The news of the death of nine-year-old Grecil Buya, in particular, caused them great distress. Grecil was killed by soldiers who claimed that she was a child soldier of the New People’s Army (NPA). United by a desire to get justice for Grecil and many others like her, they decided to band together and form PATAC. Since its founding three years ago, PATAC has held several activities and events that highlight Philippine arts and culture. Part of PATAC’s 2007 campaign “Touch a Life, Help a Soul”—the goal of which was to raise awareness and money for children victims of human rights violations in the Philippines—was held at the University of Toronto. 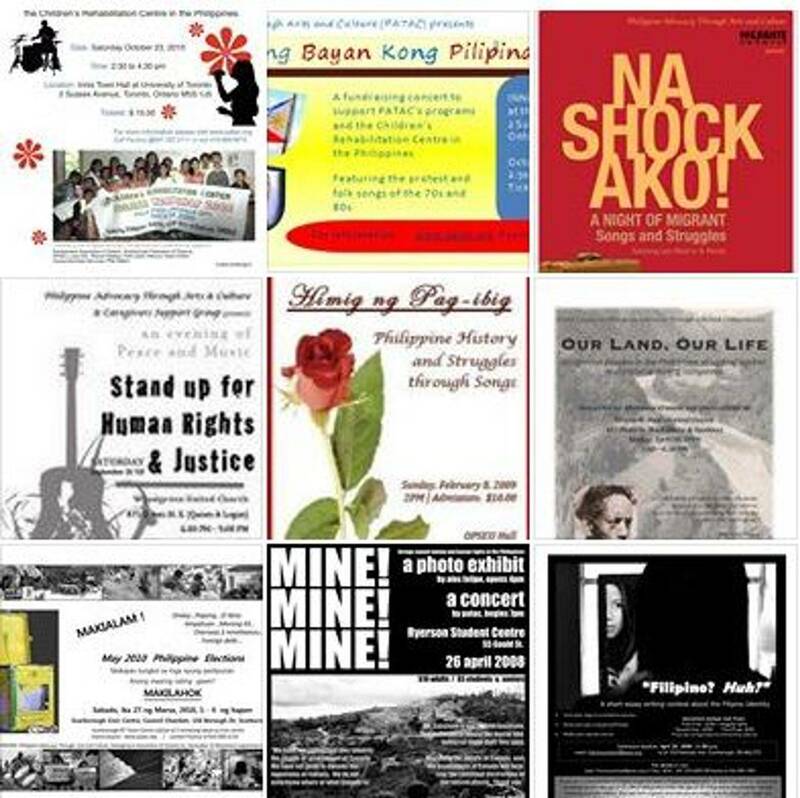 In celebration of Earth Day 2008, a photo exhibit and concert entitled “Mine, Mine, Mine” was held, exhibiting the ill effects of mining in the Philippines. What's more, PATAC held an essay-writing contest for young Filipino-Canadians; aspiring writers aged 13 to 24 were encouraged to write about the challenges of being a minority. Through these projects and campaigns, Corpuz says that it is PATAC’s goal to teach young Filipino-Canadians about their heritage by focusing on Filipino music and the arts. Realizing the need for cooperation, the group works with several non-profit, non-government organizations here and in Canada. One of the organizations that PATAC has partnered with is the Children’s Rehabilitation Center (CRC). The CRC, with offices in Quezon City, Legaspi, Iloilo, and Davao, helps children and families who are victims of violence and social injustices. It also provides them with basic medical care and counseling. Some of PATAC’s events have raised several thousand dollars for CRC. Aside from the CRC, Corpuz says that they also support and collaborate with the Philippine Independence Day Council of Toronto, Migrante-Ontario, Bayan-Canada, Scarborough Arts Council, Support Enhance Advocacy Services, Grassroots Hub, and churches. In addition, PATAC works with affiliate artists who are based in Canada. These artists perform and exhibit their work during PATAC events. Some of them even help in promoting the programs and activities. The artists share PATAC’s belief that advancing the arts and culture of the Philippines is a very effective way to educate people and inspire them to take action. Corpuz also says that to become a member of PATAC, one doesn’t need to be an artist. As long as you love art and the Philippines, you can join the group. “Even people outside of Canada can become members of our organization to expand our movement globally,” she adds. PATAC is the anglicized spelling of the Filipino word patak, which means drop. The word embodies PATAC’s basic principle of giving whatever one can afford, kahit patak-patak lang (even just a little), to help someone in need. Just as one drop is enough to disturb the still waters of a pond, one drop of kindness is enough to change the world. Young members of Philippine Advocacy Through Arts and Culture including Isabella Corpuz, Benson Corpuz, Elyka Ampioco sing ‘Lupang Hinirang’ at the opening of PATAC’s ‘Ang Bayan Kong Pilipinas’ concert at UofT’s Innis Town Hall, Oct. 23. Click here for full article in the Philippine Reporter. News coverage from Philippine Reporter. Click here. PAMASKONG HANDOG para sa lahat ng Migrante. Philippine Advocacy Through Arts and Culure, Migrante Canada and Support Enhance Access Services Centre (SEAS) presented this event as part of 2010 International Migrants Day celebration. Attended by more than 150 people, members of Migrante and SEAS board members handed out toys and gifts to audience and performers at the Splendid China Tower. 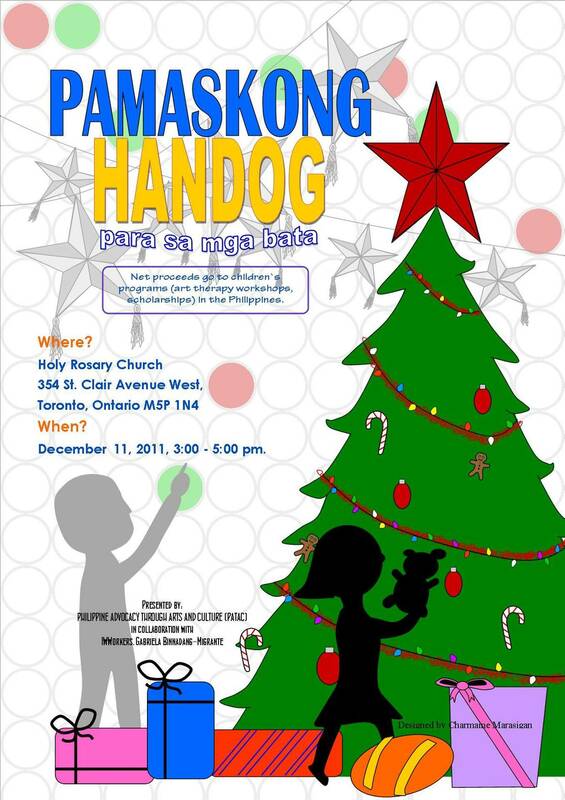 Performers Luisito Quijano, PATAC Kids, PATAC Youth, St. Dunstan’s Children Choir. Belinda Corpuz and Paulina Corpuz of PATAC were responsible for the artistic direction. Excerpts from the article written by Dyan Ruiz of the Philippine Reporter. Community gathers at Scarborough residence to hear Dr. Julie Caguiat speak about the plight of the Morong 43. Dr. Julie Caguiat came to speak at a Scarborough residence about the plight of the Morong 43 on the evening of August 26, 2010. The Morong 43 are healthcare workers who were arrested in Morong, Rizal on February 6, 2010 while conducting a health seminar and have been illegally detained since then. Dr. Caguiat told the crowd of about 30 people she wanted to “share that knowledge and let other people who receive the information decide what to do” whether that be sending money for advocacy and support of the detainees and their families, prayers, or the signing of petitions. After some discussion on what can be done to help the families, some of the people in attendance offered used laptops and reading glasses that Dr. Caguiat will bring back to the Philippines. 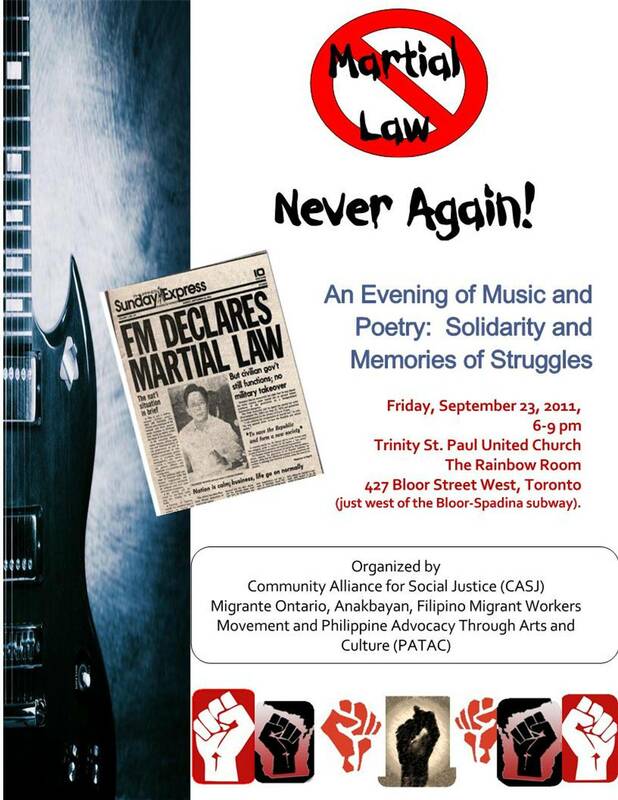 The event was hosted by Philippine Advocacy Through Arts and Culture (PATAC) and was held at the residence of Ricky and Leila Mae de Castro, who said she wanted to host the event in continuation of her student protest days at UP and to raise awareness among middle-class Filipinos in Canada of the big problems Filipinos are facing. De Castro attended another event where Dr. Caguiat spoke then organized this event to spread the Morong 43’s story to more people. Click here to read the full article. "Cindy Bourgeois carried the cross. "The cross is very important because it recalls Jesus' journey, and [his fight] against the powers of injustice and oppression," she said. Philipine Advocacy Through Arts and Culture (PATAC) sponsored the first station. There a group of children between the ages of six and 12 acted out some of the challenges many new immigrants to Canada face, reminding the crowd that Jesus too was a migrant. Pauline Corpuz, director of PATAC, says it's ironic that Canada's immigration policies are weighted in favour of professional status and higher education, but those very qualifications are often deemed meaningless by Canadian professional bodies. An immigrant doctor who attends her church was forced to take an entry level job in a restaurant because her medical degree and experience wouldn't qualify her for a job in the Canadian medical system.